Kelly James-Enger earned $3500 from one article for Redbook. Want to read the query letter that secured that lucrative assignment? How about the query that brought in $2800 from Woman's Day? Judy Gruen's query landed a $3000 assignment from Ladies' Home Journal. Susan Eley's query to SmartMoney brought in $5000! Bruce Farr's query to National Public Radio (NPR) brought in $2,000, Danny Glover's query to a technology magazine earned him two assignments totaling $8000, and Melissa Walker's query to Lifetime Magazine brought in $3000! And that's just a small list of the many query letters available in this volume! 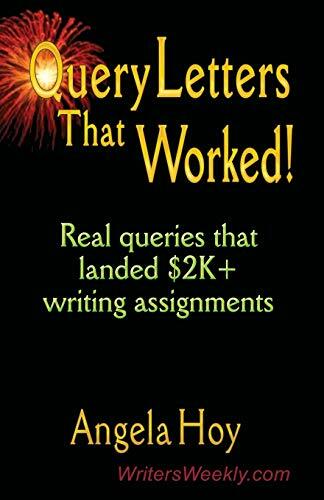 In Angela Hoy's highly-anticipated new book, QUERY LETTERS THAT WORKED!, you'll find copies of real query letters that landed writing assignments worth $2K+ for national magazines, websites, and corporations. Don't delay! Start writing your own profitable query letters today! Angela Hoy is the publisher of WritersWeekly.com, the largest-circulation freelance writing ezine in the world featuring new freelance jobs and paying markets for FREE every Wednesday. Angela and her husband, Richard, also own Booklocker.com. I've already made use of one of the form query letters and I have never had such an overwhelming response. My inbox has been flooded with positive responses to my letter. I've been in this business for more than 20 years and no one single mail shot has ever had such a good response rate. I'm frankly astonished. Now if some of this can convert to sales, I'll be set for the year! I'm devouring your book! Really enjoying it. I must say (and... yeah... you can quote me!) that, in terms of sheer value and usability, it is perhaps one of the best books for writers to be published in years. It's a valuable resource, and one which all aspiring freelancers should have on their desktop -- right there with the dictionary, and The Elements of Style. Wonderful to read examples of pitches that really worked, as it inspires even as it teaches. What a fantastic resource for writers. A CREATIVE resource, if nothing else; It helps generate ideas for queries, and (more to the point) how to write effective and powerful ones. Congrats, Ang. Great book! Many, many thanks for publishing Query Letters That Worked! I couldn't wait to receive my copy. Already, I have picked up on priceless nuggets of advice. Your section on "...secrets for finding steady freelance work" was worth the price of the whole book...and then some! Interesting, informative, and well written. Angela has clearly done her homework. This book belongs within each writer's grasp, alongside the thesaurus and dictionary. I am following the guidelines in Ms. Hoy's book: "Query Letters That Worked." Specifically, the chapter in which Ms. Hoy reveals "The Secret for Finding Steady Freelance Work." I've followed her formula, which has yielded phenomenal results.